This week we shall be checking out an important little pterosaur that vastly extented our knowledge about the evolution and overall biology of pterosaurs. Enter Darwinopterus modularis! Darwinopterus was a small pterosaur that lived in what is now China during the Jurassic Period, about 161 million years ago. When alive, it would have been a meat-eater and its wingspan was between two and three feet wide, depending on the exact species. The genus name, Darwinopterus, means "Darwin's Wing" in reference to Charles Darwin, who is famous for introducing the world to the concept of natural selection, and therefore evolution. The species name is in reference to the word, modular, which is something that is made of different, smaller parts. There are actually a few known species of Darwinopterus, but D. modularis is the most well-studied. 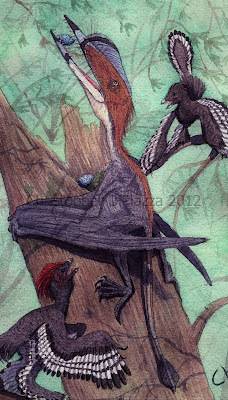 Darwinopterus raids an Anchiornis nest. Reconstruction by Christopher DiPiazza. So why is Darwinopterus such an important find? Why was it named after Charles Darwin, the father of evolution, and why is it considered "modular"? If you know about pterosaurs, the answer reveals itself just by looking at Darwinopterus. All pterosaurs can be sorted into one of two major groups, the rhamphorhynchoids or the pterodactyloids. The older rhamphorhyncoids lived from the Triassic through the Jurassic period and are identifiable by their long tails and proportionally small hind legs. (Caviramus and Dimorphodon were examples of rhamphorhyncoids.) The pterodactyloids, which started during the late Jurassic and persisted until the end of the Cretaceous period, all had short tails, longer necks, and proportionally giant skulls. (Pterodactylus and the giant Quetzalcoatlus were pterodactyloids.) Darwinopterus was a combination of both of these groups. It wasn't even a blended combination, either. It's body is almost exactly that of a rhamphorhyncoid, but it had a long neck and huge, long skull, just like a pterodactyloid. It looks as if someone just took fossils of two different kinds of pterosaur and switched the front and back parts with each other. These physical features, combined with the fact that Darwinopterus lived at the period of time in earth's history right before true pterodactyloids started to appear, makes scientists conclude it was a transition form between the two groups of pterosaurs, from rhamphorrhyncoid to pterodactyloid. Keep in mind that all organisms are technically in transition, since evolution is always going on at varying paces, but Darwinopterus happens to show a perfect middle ground between two different forms, that until recently, the evolution of was a total mystery. 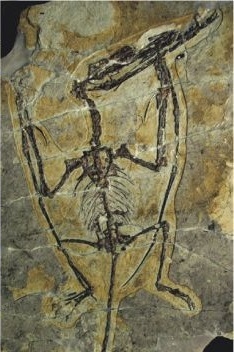 Darwinopterus modularis skeleton from Lu's 2010 paper. Note the large skull, long neck, with the short hind legs and long tail. Darwinopterus adds more to our understanding of pterosaurs than just their evolution, however. Luckily, there have been about ten specimens of this pterosaur that have been found. This isn't a whole lot in the grand scheme of things, but compared to most other fossil animals, it is on the high end. After looking at each of the specimens, scientists noticed that some of them had a small ridge on the top of the skull, which would have anchored a larger crest in life, and others did not. They also noticed that the individuals with the crest had slightly narrower hips than those without. Since this was always the combination of features, without ever any crossover, like wide hips and a crest on the same individual) it can be assumed that these were most likely different sexes! The females had wider hips, for passing eggs, and the males, with narrower hips since they weren't laying eggs, had large crests for display. This theory was proven further when a beautifully preserved Darwinopterus skeleton with wide hips and no crest was found with an egg still inside her pelvis! Skull of a male Darwinopterus modularis. Note the shallow crest on the top of the snout. Image is from Lu's 2010 paper. Female Darwinopterus specimen. You can see the egg, which fossilized as a yellowish color, right under the tail. Image is from Lu's 2011 paper. When alive, Darwinopterus would have lived in forests and was probably adept at climbing and agile flying, to not crash into trees. The shape and build of its wings show evidence of being able to gain altitude quickly after takeoff, thanks to a curved pteroid bone, which grew from it's wrist towards the neck, which would have supported a small membrane of skin in front of the rest of the wing. For food, Darwinopterus was probably an opportunistic hunter, especially when it came to small prey like insects, mammals, and smaller reptiles, since that's what the shape of its small, pointed teeth suggest. I depicted a painting of one back in 2012 eating the eggs of it's dinosaur neighbor, Anchiornis. Lü, J., Unwin, D.M., Jin, X., Liu, Y. and Ji, Q. (2010). 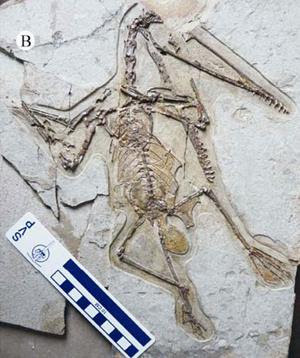 "Evidence for modular evolution in a long-tailed pterosaur with a pterodactyloid skull." Proceedings of the Royal Society B,277(1680): 383-389. Lü, J., Unwin, D.M., Deeming, D.C., Jin, X., Liu, Y. and Ji, Q. (2011). "An egg-adult association, gender, and reproduction in pterosaurs. Science, 331(6015): 321-324. Witton, Mark P. "Wukongopteridae." Pterosaurs: Natural History, Evolution, Anatomy. N.p. : n.p., n.d. N. pag. Print.